Daddy you might have missed out on some love when you were my age. I understand. Daddy, don’t you know that’s why God gave me to you, to help heal that sad place in your heart? When you take me dancing you will forget your pain as we slip and slide on the dance floor. We will laugh, and we will eat sweets together. Then we will get a tummy ache from all the sugar. You will teach me how a girl should be treated. You will tell me I am the prettiest girl in the room, and ask for a kiss on the cheek. We will get our picture taken; just the two of us together. At the cookie table, you’ll help me with my plate, and serve me a glass of fruit punch. Then, we will sit down to eat and tell jokes. 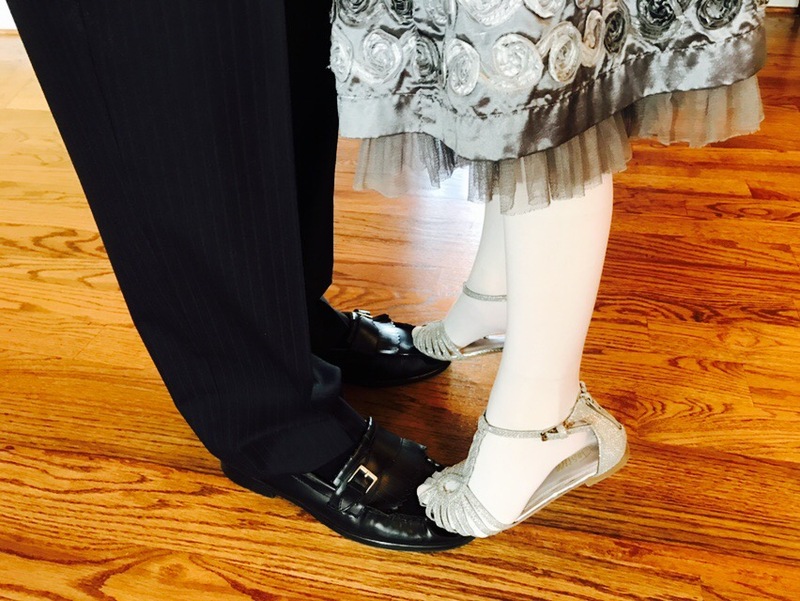 When you ask me for a dance, I’ll put my feet on yours, and stand on my tiptoes! You’re taller than me, but that’s part of the fun, because you can pick me up and twirl me around until my curls come undone! If I cry at the dance because I suddenly feel shy, you will hold me in your warm safe arms, and take your thumb and wipe the tears from my eyes. Then you will kiss both of my wet cheeks, and rub my back, and I will feel better. You will be happy when you see me do the Choo Choo train dance with my friends. You will watch my dress swirl around me as I spin in circles. You will be happy to see me running wild and free in my stockinged feet, because I kicked off my fancy shoes as soon as we got to the dance. If you’re a social daddy, we will cut up the dance floor and people will cheer. If you’re a shy daddy, you will watch me, and you will smile as I dance with my friends. If you’re a daddy with two left feet, you will just hug me for the slow dance, and we will figure it out by shuffling our feet around in a circle. You will laugh, and I won’t be able to control my giggles. If you’re a sharp dresser, you’ll wear your suit and tie. If you’re a more casual daddy, you’ll wear your jeans. Because Daddy, all the daddies are just right for the Father Daughter Dance. It’s easy, because you don’t have to know how to dance; the daddies just need to bring their daughters! And Daddy, if you bring me to the dance, and we just hang out and give each other hugs, that’s dancing enough for me! I don’t care which kind of Daddy you are at the dance; I just want you to come to the dance with me. I don’t want an absent daddy, unless, of course, you can’t help it. It might be because you are saving someone’s life, or working to get us money for food, or you’re fighting for our country. Or, you might be out making sure there are no bad guys in the streets, or you might be making sure no houses are burning down… or you might even be sick. I understand, Daddy. If that happens, we can have our own Father Daughter Dance at home. I’ll be ready. We can make cookies, and play a game, and dance to the radio. I just want to know that you love me Daddy, that you think I’m smart and beautiful and fun. I need to know I am special enough for you to want to spend time with me. I want to know that I’m a princess in my daddy’s eyes. Because Daddy, this is how I learn that my Heavenly Father loves and cherishes me. The way you treat me is how I first view GOD! And I will learn to follow, trust, and believe in GOD as my Heavenly Father; just the way I learn to follow, trust, and believe in you! Daddy, I need you to lead me! So thank you, Daddy, for bringing me to the dance. And for all the little girls who don’t have a daddy like you; I want to tell them to look for the silver lining: Girls, God loves YOU! God is your Heavenly Father! He thinks you are beautiful, and smart and fun, and He wants to spend time with YOU! His name is ABBA, and He is perfect! God loves you so much, He came down to earth as a baby. That baby grew into a man. That man died on the cross for all of our sins. That man is Jesus, the Son of God! All the daddies and mommies and daughters and sons who believe in HIS name, will get to dance in Heaven one day. Believe me, you will not want to miss that party! Daddy, please make sure you meet Jesus and become friends with him; because this way we will never, ever miss a dance in Heaven, and we will be together forever and ever! I love you Daddy! Daddy, lead me on The Lord’s path of righteousness and love! How sweet. An open letter every daddy needs to read, and a story every daddy who needs to know God needs to hear. What a wonderful world it would be if every daddy lead their little girls on the path of righteousness. Thanks Angela! Revisiting, just because I can. Love this little story. Miss you like crazy too. The only I can say after reading this with tears in my heart…WONDERFUL! Wonderful from a dad who has three adult daughters.